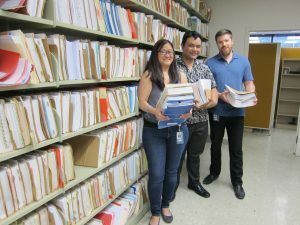 They’ve been dubbed “The Three Amigos” by their co-workers at the Department of Labor and Industrial Relations — three millennials hired as office assistants to help digitize the mountains of paperwork from some 20,000 claims a year in the disability compensation division. “It’s been a team effort of the whole division with lots of cooperation from everyone,” said Nakamura. She also was quick to credit division administrator JoAnn Vidinhar for the push to improve the process and serve the public better. Tobin said the rewards come from being able to help people who are struggling because they can’t work anymore. “Their whole life depends on what happens with workers’ compensation. They depend on us to be as timely and efficient as possible,” he explained. Mercado, whose computer-based training was part of his degree from UH-Mānoa’s Academy of Creative Media, said they’re working on an “optimization project” with a $3.2 million appropriation from the state Legislature to digitize what up to now has been volumes of paper-based records. “It’s part of modernizing state government and testing out new ways of doing things,” he said.